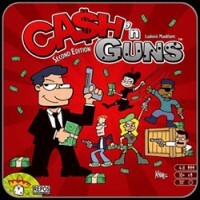 In Ca$h ‘n Guns, players will point foam pistols at each other and try to intimidate their opponents into letting them have the largest share. The bravest crooks enjoy the most money – but only if they live long enough to spend it! I make you an offer you can’t refuse. Give me all the loot or I’ll shoot you. This being the core idea of Ca$h ‘n Guns and rules being simple as it gets. Promising fun and laughter for every member of famiglia. Just don’t Cosa Nostra it, but share or if you will, expand the Family. 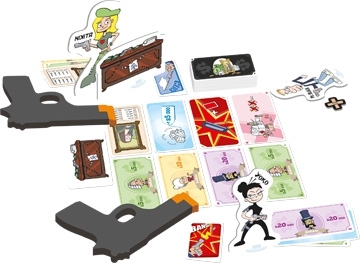 Each player pick their avatar of cartoony Mafioso, special role card (optional) and foam core gun plus the ammo. Loots are divided in stacks of 8 cards and first 8 are laid on table as loot of the round. One player is picked as Godfather who leads the game through the round(s). First players pick a bullet which can be either click or bang. Click doesn’t harm others and is purely for bluffing. Bang is opposite, but there is only three of those in your hand. Then comes the Mexican standoff phase, where everybody pull their guns at somebody. This point Godfather can tell one player to change their target, but not at whom. Then he/she counts to three and those who want to chicken drop their gun. Finally the bullet are checked on those who didn’t chicken out, if somebody gets bang they are out of round and get wound token. Three of these and you’re out of the game. Those who remain share the loot, which varies from money, diamonds, art, medkits and ammo to who is the new Godfather with privileges it comes with. Game goes on this fashion until all but one is dead or there aren’t any loot left. At end the points are counted and victorious party announced followed either by Marlon Brando or Al Pacino impression. Games are fast and it is a game that begs another go and another after that. Art on the cards, avatars and tokens are cartoony and paints a picture of something fun and relaxed rather than gruesome that it could be in reality. I think this is great idea for it makes it more easily approachable for players of all ages. I have played this with my kids and it didn’t feel least bit wrong, no more than running around house or yard shouting bang bang. Guns are sturdy and fun to handle, they’re made out so that its obvious that they aren’t real. It is fun to notice somebody placing the gun in imaginary shoulder holster with dubious look on face, always sparks laughter. Have even seen people doing ankle holster and Die Hard impression, your imagination is the limit on this. On a last note I really like the wound markers that are two crossed band-aids. There isn’t anything complex in the game. Kids and elderly can learn it and every round player who is the Godfather will lead the game rounds through their respective order. On addition there is the Godfathers desk where is written the round order for a reminder to Godfather. Not that there is much to remember. It is really fun party game and it certainly makes people laugh. I can understand some having reservations that come to this theme and guns in general. All I can say is that I am sorry you’re missing out on the fun. I doubt that this game ever turned anybody in to a Mafioso or criminal. It is easy going fun for bigger groups and really does need the minimum of 5 players to be good. That and it starting to repeat itself very fast being the only downsides. You get good 2-4 games out on one evening with people enjoying themselves without accusations, like The Resistance does. If you like the idea, but don’t like being accused, this is the replacement for you. It is great in-between game after heavier games, it unwinds the people and gets them prepped for something bigger again. I find it inferior to The Resistance, but it is still different enough to bring on table in same evening and have fun. If you like easy going and fast games or need an ice-breaker this your deal right here. I personally recommend it as in-between game. I bought this game 2 weeks ago, and already it has seen 6 plays at 2 separate game days. It’s a huge success! The game lasts 8 rounds, and in each round, there are 8 pieces of loot to take. Each round, each player loads their gun (they have 8 bullet cards, 3 BANGs and 5 CLICKs). Then, the godfather (or godmother) will call out a countdown, and everyone will aim their gun at someone. The godfather/mother may tell someone to redirect their aim. Then there’s the “courage” phase, where everyone decides to stay in the round or not. Everyone who gets out of the round knocks their standee over, and places their bullet (face-down) in the center. Once everyone has decided whether or not they are getting out, everyone with and invalid target places their bullet in the center, and those WITH a valid target flip it over. Those with a BANG will give the target a wound (3 and you’re out). Not only that, the target is out of the round. Those still standing will split up the loot. The godfather/mother gets first pick of the 8 loot cards and the godfather’s desk. (the one who takes the desk becomes the godfather for the next round.) It goes around the table, dividing the loot until all the loot has been taken. Then the next round starts! The game lasts 8 rounds, and whoever has the most value of loot wins. Apparently, the 1st edition only had cash for loot. In this version, there are 4 different types of loot. The prominent one, is, of course, cash. The next category of loot is paintings. At the end of the game, you get a value for the entire collection, and the more paintings you have, the more value it is. Then there are diamonds. The value of the diamond loot cards are less than the cash cards, BUT – whoever has collected the most diamonds at the end of the game gets a $60,000 diamond bonus. There are also 2 first aid kits, which allow the person who takes it to heal 2 wounds. The person who takes the clip gets to exchange a ‘click’ in their hand with a ‘bang’ from the center (used bullets). This game is A LOT of fun! Just getting into the theme of the game, and forcing a player to get out is a lot of fun! The banter around the table just before getting ready to aim is great, too. Psychology definitely plays a role, too. Because you don’t know whether or not that kid whose pointing his gun at you is bluffing or not. Highly recommended! Add a Review for "Ca$h ‘n Guns (Second Edition)"